We have snow here in the North Carolina Piedmont! Alright, I realize that’s not a big deal for you northern folks, but when flurries are in the forecast here, we hunker down with milk; bread; and, in my case right now, cookies! (I have two, yes two Girl Scouts in my family!) So I’m ready to embrace winter with cool resources, from Snowy Day Month materials to $250,000 in prizes to inspire change. Did you know January is Snowy Day Month? It also kicks off the yearlong celebration of 100 years of Ezra Jack Keats. Get free teaching tools and tips, lesson plans, and links—everything you need to use Keats’s books as building blocks to literacy. Your kind and creative students can make a difference in the world and win from $500 to $100,000, and you could win a grant of up to $5,000! All told, there are $250,000 in prizes in this inspirational challenge. Get started with a free video lesson plan—led by a teenager who invented two lifesaving devices—and free printable resources. Learn more here. Engage reluctant readers (and your class pranksters) with this new book. In The Terrible Two Get Worse, pranksters Miles and Niles’s powers are tested when Principal Barkin is replaced by his stern and cunning father, Former Principal Barkin. Your students can join the fun at the Official and Secret Website. Click here. Don’t forget to post a comment for your chance to win the pop-up book! PS: Where can you get thousands—yep, thousands—of learning activities for preschool through grade 1? Check out ABCmouse.com/schools. It’s completely, absolutely, without a doubt free for schools! I love The Snowy Day. I have used this for years and all ages love to read and listen to the story. You can do so much with it. With arts and crafts, dramatic play and snacks. Always always the snowy day. I love it. Oh mercy, I live in the Southeast where we just had our first real snow. The Ezra Jack Keats link will be a great resource for my classroom teachers. What a great pop-up book! I have a small but growing collection of pop up books and this would make an excellent addition to our library! Especially during an election year when the election of a president, Washington D.C., and symbols of the U.S. are at the forefront of all of our Social Studies lessons. Thanks so much for all of the awesome resources – I am especially loving the link to THE SNOWY DAY and the Keats website … wow! Terrible Two Gets Worse is sounds like a book that some of my reluctant readers would read. Thanks for recommending it. The Snowy Day is such a fabulous book for winter themes in any classroom. From an author study to snow activities to reproducing Ezra Jack Keats methods of illustrating, this book has it all! I am all about Presidents’ Day and the students. The White House seems perfect to help celebrate this holiday! Pop-up books have always been my favorites. I have a small collection of some really cool ones that I display for kids – but they are asked to be very careful with them. The White House pop-up sounds like it would be a great addition! Thank you for letting me know about it. We have many students that make a difference every day – small and big. Thank you for sharing this contest. The paradigm challenge sounds very interesting. I think I will try to find time for it in our busy schedule. I would love for one of my students to place in the top 100 and win! The Terrible Two Get Worse would be a valuable resource in my classroom. P.S. That White House is awesome! I would love to win the White House pop up book. It would be a great accompaniment to my America pop up. I love the year of Ezra Jack Keats. I love Mac Barnett (The Terrible Two Get Worse)! And I am ALWAYS looking for books for my reluctant readers! Larnette, check out the sweepstakes from Disney Books at TheMailbox.com/disneybooks. Each month a teacher wins a class set of books, including titles especially for reluctant readers. Here’s another great contest for winning books, this time from HarperCollins: TheMaibox.com/classacts. 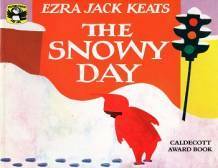 I love Ezra Jack Keats “Snowy Day” as do the children in my classroom at my Day Care. The Snowy Day needs to be read everyday here in Vermont as we have very little snow and more rain coming in the next few days. I really think the Ezra Jack Keats resource is awesome! How fun for the classroom! The Terrible Two Get Worse is so true. Yea! Thanks so much! I am looking forward to sharing with my students!